Boss company is one of the fastest 500 growing private companies in America as ranked by Inc. Magazine last 2003. A little company profile of the Boss office products is it was established in Los Angeles, CA, in 1990 by William Huang,CEO. They began as an importer that are buying chairs from Taiwan and distributing them to retailers/ dealers in US. In 1991, This company is one of the pioneer office that set up their manufacturing facilities in China. As of this day they have distributors all over the world and US warehouses and showrooms in Commerce, CA and Atlanta, GA. The company specializes in budget and mid market office chairs, casegoods, training tables and reception furnitures. Boss Heavy Duty Double Plush Chair has a product dimensions of 31 x 33.5 x 45.5 inches with a weight of 50.2 pounds. This chair is actually made for heavy and larger people as it has a 350lbs weight capacity. The seats are also extra wide and deep to provide maximum pleasure for people with larger frames. This way their legs won’t pressed against the arms of the chair which is a common problem for larger people sitting on standard size chairs. The height adjustment lever is located just below the seat. The spring tilt mechanism is made up of heavy duty materials to accommodate heavier people. This function is used when you just want to relax your back and slouch for a while. The back part of the chair is also thickly padded and has a reinforced lumbar for your lower back. You can not question the durability of this chair as it is made up of 27-inch brushed metal five star base with 3 inch double wheel casters. These 5 double wheel casters makes this chair very easy to move around even around carpeted areas. The arms are not adjustable and is in one single piece. Even though it is not adjustable the angle in which they are made is at the correct height to provide support. The seat is compose of double plush cushions with thick padding and upholstered in black caressoftplus. Caressoft generally refers to a fabric that started out as a leather but ended up infused with some sort of polymer to give it strength and durability. This cheaper alternative will not be as shiny as leather but is close to its softness. Longevity of this is lower than the original leather. So when choosing a chair with leather and imitation leather be sure to consider the quality and price point you require. Unpacking and assembly of the Boss Heavy Duty Double Plush Chair took about 25 minutes. This chair will come out in 5 pieces and each wrapped very well. Following the assembly manual and basic pictures with a power screwdriver will do the trick. 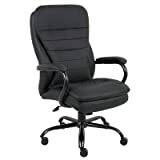 The Boss Heavy Duty Double Plush Chair is ranked number 72 in Amazon under office products > Office Furniture & Accessories > Chairs & Sofas > Managerial Executive Chairs. Available in Amazon with free shipping, this is actually a good investment because this chair is heavy duty and will lasts for a long time. Materials used are very sturdy and durable. It has a 95 customer review and is rated 4 star by customers in Amazon.